What inspired you to join the movement for health equity? When I was a medical student I lived in Botswana for a year. At the time, Botswana’s prevalence of HIV was one of the highest in the world, tuberculosis prevalence was the highest in the world, and life expectancy was 36 years. Growing up in West Philadelphia, I had witnessed the confluence of illness, poverty, racism, and structural violence, but because Botswana is one of the only countries in Africa that has developed a publicly-funded health care system, I saw the social and political determinants of health at work. For me, this experience was the beginning of my global health and social medicine trajectory. What makes teaching at UGHE different from other universities? If we don’t acknowledge that health is driven by social and political determinants and not just biological determinants, then we will never fully achieve health equity. [At UGHE] this philosophy is woven into the curriculum for not only the master’s program, but for the medical school, and, eventually, for other degree programs. [In Principles of Global Health Equity] we explore the history of social medicine and the progression from colonial medicine to international health to global health. While social determinants of health are the foundation of UGHE’s MGHD program, most health professionals across the globe are not learning this rigorously enough. Our students are trained to think about health care in a more holistic way than what has traditionally been taught. How does this unique perspective of health impact UGHE’s graduates, and ultimately the world? I think we all agree that health systems across the globe are imperfect and need radical change to really ensure that patients who are in the bottom 99 percent–be it the bottom 99 percent in Rwanda or the bottom 99 percent in the U.S.–have access to care. The students of UGHE believe that. I look at the social movements that have grown from each new generation and I hope that graduates of UGHE are going to be leaders of these movements, leaders of universities, leaders of health centers, hospitals, and clinics. They will set a tone rooted in health equity and become incredible change agents. Their impact is the real product of this University. UGHE’s MGHD program is designed for professionals from diverse professional backgrounds. What do you see as the role of non-clinicians in the global health movement? There is something to be learned from all disciplines that are related to health, as well as disciplines not related to health. If you want to address structural and political determinants of disease, you can’t do that with doctors alone, and in fact, you can’t do that with only doctors, nurses, social workers, and public health professionals either. We need to think about engaging people who are in the agricultural sector, the finance sectors and administrators. UGHE’s MGHD program challenges tradition by bringing health professionals together in a classroom to find new solutions to old problems. You’ve built your career around that idea–disruptive pedagogy. Can you tell us more about EqualHealth? After working in post-earthquake Haiti, several of my peers and I were compelled to transition from relief efforts to long term growth of health infrastructure. 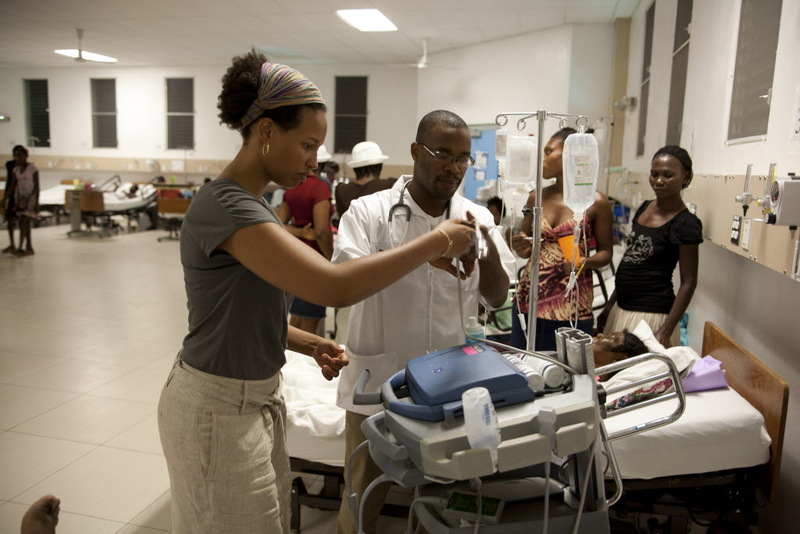 Over time we had developed relationships with our partners in Haiti: teaching hospitals, medical schools, nursing schools, and medical students. When we thought about where we could have the greatest impact, we knew it would be with the next generation of health professionals. We saw an opportunity to work in partnership with our Haitian colleagues to not only provide immediate earthquake relief, but to build a new culture of health professionals’ education. At EqualHealth, we work with profoundly talented individuals–many of them far more talented than any of us were–who don’t have access to opportunities. Opportunities not only to learn and to grow as leaders, but also to work in functional health systems. Our students are ready to change the world. But it can feel impossible considering the current state of health care in Haiti–and that is where EqualHealth comes in, helping students to dream of the possibilities for change. There are very few universities who have done what UGHE is trying to do, which presents a unique challenge for the staff, faculty, and students. How disruptive can we be? We aren’t just recreating the traditional education paradigm, but instead we are thinking outside the box to achieve a different outcome–one that improves health care for everyone.